Get three lights in one with this torchiere floor lamp with adjustable side lights. The design gives you both general room illumination, thanks to the top torchiere light, but also adjustable task or reading light from the 2 side lights. Each of the side lights and the top light has an on-off switch, so you can vary the light output to just what you need. The thin lamp pole and the round base are both in a brushed nickel finish. Frosted glass shades are on the side and top light. Overall: 72" high. Round base is 10" wide. 74" long silver cord. Weighs 17 lbs. Top torchiere glass is 11" wide x 5 1/2" high. Side glass is 5" wide x 4 1/2" high. Uses one maximum 150 watt medium base bulb for the top light and two 40 watt medium base bulbs for the side lights (bulbs not included). On-off switch on each light for great lighting control. 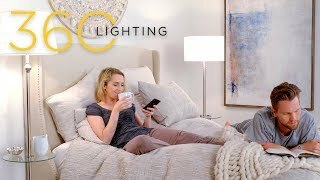 Value-priced style from the 360 Lighting brand. 3-in-1 design with top torchiere and two adjustable side lights. Brushed nickel finish. Metal pole and base construction. Frosted white glass. My purchase of The Ellery Brushed Nickel Tree Lamp, is an absolute beautiful lighting fixture, that l would simply love to have in my living room. I want to be able to have ambient light and reading light at different times. Similar to what I previously had. It was broken. Need reading lights for recliners. Like top light for room, and frosted glass shades rather than plastic. I bought for an elderly woman to brighten up her room and make it easier to see and read. I liked the Shape and Finish. Would have preferred only 1 Side Light though I don't have to turn both on at once. I had one similar and I'm hoping this one is as good or better. Need reading lamp. This should give good light. Needed one and this one looked good. Wanted a torchiere lamp with extra reading lights for my son in college. Most importantly, wanted glass lamp shades instead of plastic. The smaller lights look like they are substantially mounted onto the base pole - another important factor in picking this lamp. Free shipping makes it very easy for me to get this to him at school. Thanks! White contemporary shades with brushed stainless. Nice looking, great price, exactly what I was looking for. Room lighting and direct floor lighting. We need a lamp to brighen our living room and a light for reading (for a chair w/ottoman), We've looked at other places and couldn't quite find the right combination and height. This was perfect! And the price is reasonable as well. Thanks! To replace a similar floor lamp that expired. I just received the black floor lamp and I love it so I want to put a second one in my living room. The white one is for my bedroom. Service was great. I picked it because I knew it would look good in the room that I intend to put it in. Need lighting in dark corner for general purposes and reading. Had this type of lighting from Lamps Plus before and liked the style. I was looking for an affordable brushed nickel finish torchiere with two gooseneck side lamps for a bedroom. This is not exactly what I wanted, but it is affordable. It goes with what I already have. And, it seemed like a quality product and a good value. It appeared to be the most practical solution for my lighting needs. Sale for one & fits my bedroom decor. PURCHASED TWO OTHER LAMPS SIMILAR TO THIS ONE. I'm a tall person and I needed a floor lamp that wouldn't blind me when I'm standing next to it. I wish this were a little taller but it's pretty close. We're putting it next to a piano so the task lighting is also a good bonus. I need a light in my computer room desperately. No light except a window and small lamp. Only room in the house without an overhead light. Hopefully, this will fill the ticket. Price is great. Matches my other lamps and I like the 2 reader lights. I needed this style instead of the one I have. And the price was right. Can anyone say whether the base is heavy and sturdy? One customer said her dog knocked it over but didn’t say if it was a lg or small dog. I have toddler grandkids. Thank you. BEST ANSWER: I found this lamp very sturdy. Of course it is next to the couch and doesn't have room to go around it. So not liable to be knocked over. Yes, the base is quite heavy. You should not have a problem with the grandkids. Can LED light bulbs be put in the 1Y326 model? Yes, I've had LED bulbs in mine ever since I got it. It works perfect. yes, the lamp will work with a comparable LEDs in the three sockets. Why is the price different than the recent January sale and clearance catalog I have? Could someone tell me the heights of the lower two lamps...I know the highest height is 72"? BEST ANSWER: Hi - From the bottom of the side glass to the floor measures 40" and 50". That helps a lot, thanks very much ! BEST ANSWER: Hi, 1Y326-15V81-32J09-32J09 includes LED light bulbs. What type of light, bulb, 100W, 3 way bulb does the lamp take? I put in (white light) LED lights: 100, 75 and 60. It takes 3 bulbs; you can choose. Does someone come out and deliver and put together a lamp after you buy it????? BEST ANSWER: Hi - no, we don't offer that type of service, but it is very easy to put together this floor lamp. It takes just a couple of minutes and is as simple as joining together the pole segments. It's already connected by the wire running through it. Just unpack, straighten the wire and screw the 3 sections together by twisting poles. No, you have to assemble it yourself. The lamp works great. Do you have replacement glass covers (shades) ? Dog knocked over the lap and broke the big one at the top. BEST ANSWER: You can indeed order replacement glass shades for this floor lamp. Below I have included the style number for the glass shade. Since it is a part order we will need for you to call in and place the order over the phone. I am concerned about issues with torchiere lamps in general. Is there a way to adjust this lamp if it begins to tilt to one side? BEST ANSWER: Yes, if the lamp tilts you can retighten the base to make it stand straight. This lamp is heavy and stable. Agree make sure pole parts screwed well. How high off the floor in inches is the lowest light? BEST ANSWER: perfect height as replacement for a side table lamp. Appox.4 feet off the ground. This lamp lights up a dark condo beautifully, as we have the sconces pointing in different directions. Bulbs can get warm, so maybe use LED conversions. 39 inches to the bottom of the glass fixture. Is lamp good for bedroom? BEST ANSWER: Don't see why it wouldn't be perfect for any room. There are three lighting options and you can put the capacity bulbs you choose in each one. this is great for a bedroom! lots of light! I'm considering buying the Ellery Torchiere for my son's dorm room. I need to be able to move it there and back in a car, not an SUV. Is the pole solid or does it screw together and screw apart in shorter sections? BEST ANSWER: The lamp comes in sections. The electrical wire though runs through all the sections. I have emailed you a copy of the assembly sheet for a visual. The lamp comes apart in shorter sections. Pole is in 3 parts. It is a nice corner or recliner reading lamp. You can direct the reading lamps in any direction including up if you don't want direct light. Recently bought a house that had no light at all in one of the bedrooms. It became my computer room. This 3 light floor lamp offers light whenever I need it. During the day, I use one or two of the satellite lights and at night I use the top light which floods my entire room. Just exactly what I needed for this room. Delivery was prompt. Assembling the lamp was much easier than opening the very secure packaging. It is the perfect light for my office space. I ordered 2 of these lamps in brushed steel for use in areas with insufficient lighting. The lamps were easy to assemble, but be careful when you unpack them. I broke a globe taking it out of the box. I STRONGLY suggest that you unpack from the bottom of the box (that's where the glass is). It's awkward, but no more so than opening from the top. I opened one each way. The glass in the globes is not plain white, as it appears on line. They look slightly marbleized - very attractive. One concern that I had when ordering was how much the sidelights could rotate, since they are not the usual goose neck style. The answer is that they provide a good deal of flexibility. They twist forward and backward, and swivel up and down. This is a very nice lamp at a good price. Gives a lot of light. We recommend this lamp. It was easy to assemble, provides an excellent range of lighting and looks like it cost much more than it did! The lamp is fine and taller than expected but fits our place for it. Assembly once you get it unpacked and clean up the mess it makes is easy and straight forward. Switches are on/off so don't expect dimmers. Construction is good. based on the reviews here, I bought 6 of these lamps. 4 of them are not standing straight. Hi Clayton T., terribly sorry to hear that 4 of your 6 lamps do not stand straight. Please reach out to our customer service team immediately so that we can begin working on a happy resolution for you. Thank you. I purchased two of these torchiere lamps and am extremely pleased with them. They are well constructed, take up little space and look stunning with very sleek styling. The sidelights are perfectly positioned and swivel easily. I am using one in my main floor study and it is the only illumination I need in the room. I like working in a brightly lit room when I'm reading or working on the computer and the Ellery Brushed Steel Tree Torchiere fits the bill perfectly. I'm using the second one in a hobby workspace to supplement the existing lighting. Again it's a perfect fit. I was very happy to purchase these lamps at a reasonable price. They were well packaged, delivered very quickly and easy to assemble. Just what I was looking for! Very well packaged, easy to assemble. Great lighting. Sleek & slimline, doesn't take up a lot of room. Highly recommend. This floor lamp is very nice and the extra 2 lamps direct light where you want it. It is well made and give off plenty of light to fill a room. I would recommend this floor lamp. good room light. Also great for knitting. I like it very much. It seems that the shade is a bit too small, otherwise, it's ok.
Great quality at a great price. Great lamp. Would buy again. I am very happy with this floor lamp. It was way to assemble and is very sturdy. Beautiful lighting with 3 lamps. Would purchase again. Very happy w purchase. Well packed, easy to put together. Brightens a dark bedroom beautifully. Have ordered from Lamps Plus before...will again. I am very happy with this lamp. I provides lighting options, bright light for reading, is heavy and stable, was super easy to put together and was priced reasonably for the high quality. I bought the lamp and light bulbs for my parents for Christmas. They love it. Perfect light. Good quality glass shades and sturdy construction. Would recommend. Easy to assemble- my 68 year old mothers did it on her own since she couldn’t wait! I purchased this lamp for my craft room. The amount of added light in the room with this lamp was just what I needed. Love it! Looks great and works well! The lamp is just what we wanted and is of good quality. I would use this company again if I needed another lamp. One of the glass shades got broken and when I called for a replacement it was done on the spot. The individual was very good at confirming the lamp, the size, and the finish. Excellent product and service. Easy assembly. Good, decent lamp for it's price point. Happy with purchase. Review Title sums up the product and it was easy to assemble. You can go up to 150 watt in the top, 40 for each of the lower two bulbs. Gives you options for lighting. We like it nice and bright. Recommend this. very pleased with this lamp! well-made and sturdy! gives lots of light in my daughter's room! would highly recommend this affordable lamp! Got it home. Put it together. Put the bulbs in. Trashed the old one. Great service and very friendly staff. Will be returning. Shining brightly in all 3 directions! Ellery Brushed Steel Tree Torchiere 3 light floor lamp fit our special needs perfectly. It was easy to assemble and did not continuously blow the fuse as our last lamp did that was not purchased at Lamps Plus. In fact, we recycled that previously replacement lamp. We owned for about an hour. The lamp actually looks much better than expected, at least with the decor it was purchased for. Using only 1-2 lower lights most of the time, as it gives enough illumination to a fairly small living room. I love this lamp as it is versatile. This was the perfect lamp to display my Philips lights. 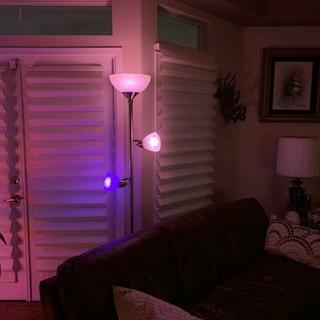 This lamp perfectly displays my new Philips HUE lights! We like the look and function. We like the look and function. Matching set is perfect for our room. Purchased this floor lamp in Laguna Hills store and Carol Kawashma waited on me. She was fantastic. Very friendly, knowledgeable, and helpful. Love the lamp, but wished it came in other colors. Store has an exclusive patent on this floor lamp, so why not have it in black, bronze, gold? One color does not fit all. great for the price. matched ceiling fan and other overhead fixtures to complement other rooms. Works great, low price, and was able to bring home when I bought it. I got what i paid for. Satisfied with purchase received as seen on screen usually I don’t purchase on line if in person I would have purchased a more substantial manufactured game product. I wouldn’t recommend this floorlamp. I liked the look of the floor lamp, but one of the turn on toggles broke the first week of use. Hi Paula C., so sorry to hear that one of the switches on your lamp broke after only a few weeks. Our customer service team would be happy to provide you with some solutions to make this right, so please reach out via phone, email, or chat. Thank you.